Training Well broke. Steady eddie trail horse and some gaming. 10/24/15 - Deena was euthanized today. 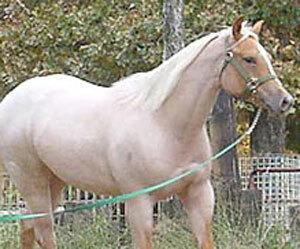 Deena was purchased after the auction from the Kill Buyer. I paid $100 over the price he paid and so I got to walk away with this mare who was already in the pen to be shipped to the slaughter yard. Deena is a 9 year old registered Appaloosa mare although she shows no Appaloosa characteristics. She is sound, broke to ride and a steady eddy on the trails. This lucky mare was realistically already rehomed before I even made it home with her - although they asked for a "trial period" before making it official. I had a gal I know at the auction take her home with her and then she was going to bring her to me later in the week. When she got home with Deena her husband fell in love and they subsequently adopted her. At one point she was used in gaming, but that was a couple of owners ago. She has had two foals, but is supposed to be open at this time.